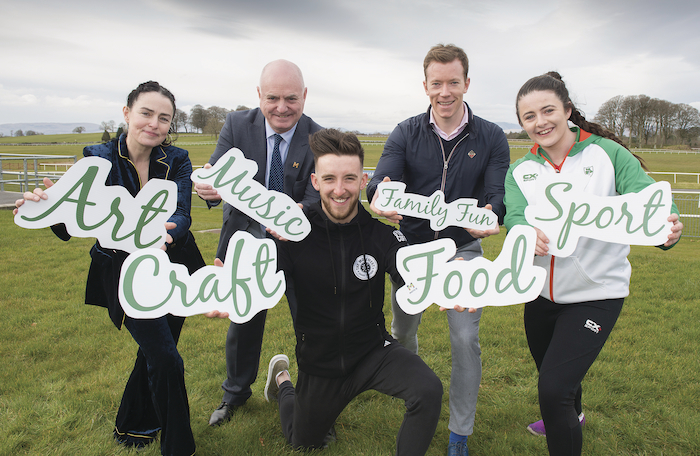 Pictured at the launch of Made of Mayo, the flagship event for Mayo Day in Ballinrobe Racecourse, were Breda Mayock (artist/musician), Peter Hynes (chief executive Mayo County Council), Derek Doohan (The Movement Gym), Donal Vaughan (Mayo GAA), and Michaela Walsh (athlete). Photo: Michael McLaughlin. Mayo Day is a day dedicated to the celebration of the arts and culture, vibrant communities, and unquenchable spirit of County Mayo. Now in its fourth year, Mayo Day has garnered international success and recognition as a highly anticipated yearly celebration. Previous Mayo Days saw activities take place locally, nationally, and internationally capturing people’s attention within the county and around the world. 2018 sees the arrival of an incredible new flagship event Made of Mayo, taking place in the beautifully situated Ballinrobe Racecourse, which will be transformed into a hive of Mayo Day celebration and artistic wonderment, with something for all the family, admission is free and the event will run from 12 noon to 6pm. Speaking about Mayo Day at the launch of Made of Mayo, Peter Hynes, chief executive of Mayo County Council, said: “One of the original and ongoing aims of Mayo Day is to promote Mayo nationally and internationally as a positive location for business and tourism and to further enhance the image of Mayo as a progressive ‘will do’ county and the heartbeat of the Wild Atlantic Way. The multifaceted event will include a spellbinding Mayo Artists Exhibition featuring artworks from the best of Mayo artists, and artists inspired by their time in County Mayo. Coordinated by Mayo County Council Arts Office, and selected by director of the iconic RHA, Patrick T Murphy, this inaugural exhibition will reveal the true inspiration of County Mayo as seen through the eyes of the most talented artists. Made of Mayo will have so much more to be explored including the Literary Lounge, a place of celebration of Mayo writing. Many people are unaware of the major success garnered by Mayo’s current young writers, the Literary Lounge will tell their stories and celebrate their successes, with writers’ pictures and biographies, a bookshop selling Mayo books, signings, readings, talks, story-telling and a puppet show for the little writers of the future. Writers involved at the event include Elizabeth Reapey, Terry MacDonagh, Helen Falconer, Faith Hogan, poet Ger Reidy, Bernard O'Hara, and Michael Mullen, with more to be announced. To add to the celebration of Mayo’s literary landscape, an exhibition of never-before seen photographs from the Liam Lyons Collection accompanied by a display of recently restored old maps of the Ballinrobe area, will be also be on view for the first time. Made of Mayo will also have lots of activities to choose from at its Workshop Hub. Well-known local chef Ronan Fox will be on-hand to teach how to flip pizzas and add the most delicious toppings at his pizza making workshop. Mayo Roads Safety Authority’s interactive screen-printing workshop will be the first of its kind at a Mayo Day celebration, where families can work together in printing Mayo Day 2018 safety messages on high-vis bibs to take home with them, ensuring that all the family are safe and seen for Mayo Day and beyond. Haley Coleman’s live make-up demonstrations will also take place in the Workshop Hub, teaching her many tricks-of-the-trade to those lucky enough to grab a space at this free-ticketed event. No family event would be complete without a sports section to get the competitive juices flowing. The Sports Enclosure will include sports drills and workshops from some of Mayo’s finest sportspeople in rugby, football, and many other realms. Andy Moran’s very popular team from The Movement will be on site to put participants through their paces through exercise and training skills, while Connacht Rugby’s Dave Heffernan will be on hand to run the very exciting Rugby Hub within the Sports Enclosure. More details including event timings and all sports personalities who will be involved are soon to be announced. The Sports Enclosure will also include the highly anticipated inaugural Made of Mayo Hobby Horse Derby. An opportunity for friends and family to race each other and potentially some other well-known Mayo personalities, all while running with a hobby horse – this highly competitive race will be a must-see element of the day. The Made of Mayo Craft and Design Showcase is an opportunity for premium artisans and designers to display their valued work in a relaxed showcase environment. This opportunity allows people to purchase products and goods of the best and brightest local craftspeople in the county for Mayo Day 2018. All businesses which produce products and goods in Mayo are invited to get in touch with the organisers and let them know if they would like to be involved in this exciting element of Made of Mayo. Music and gastronomic delights await in the Music and Food Village, guests can enjoy tasty fare from Enrica’s Chocolates and Cabots Food of Westport, all the while being spellbound by the electrifying performances of Hit Machine Drummers and Cronin, whose popularity continues to dominate on the live music scene. And to really give a festival feel to proceedings food concessions will flank the central area of Made of Mayo with Mack and Spud, Clew Bay Cookies, and Killary Fjord Shellfish, among others, selling their delicious hot and ambient food offerings. Special guests to the music and food line-up will be announced in the coming weeks, so stay tuned for more exciting additions to the Music and Food Village. 2018 is Bliain na Gaeilge and what better way to celebrate Mayo’s rich Irish language heritage than by getting involved in La Mhaigh Eo at Made of Mayo. Representing Mayo’s three Gaeltacht regions the La Mhaigh Eo area will have live music, sean nos dancing, and lots more craic agus ceol, including an opportunity for teenagers to win vouchers to Mayo Gaeltachtaí for summer 2018, competition details will be announced at the event.